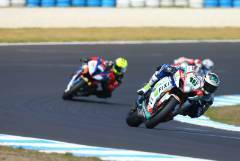 After a successful pre-season test schedule down at Phillip Island, Fixi Crescent Suzuki’s Leon Camier was left frustrated after two disappointing races Down Under. Unfortunately for the Kent youngster his testing form deserted him despite his best efforts to the contrary, a poor start to race one and a wrong choice of tyre saw Camier fight to take ninth place just behind Jonathan Rea but in race two Camier was another victim of Chaz Davies’ incident and rejoined the track in last place. After that it was a case of head down and rattle off some fast laps to try and bridge the gap to the front pack but sadly Leon ran out of laps and brought the Suzuki GSX-R1000 home in ninth place again. In contrast to to the Englishman, his French team-mate Jules Cluzel had a weekend to remember for his debut on board the Yoshimura-powered Fixi Crescent Suzuki. 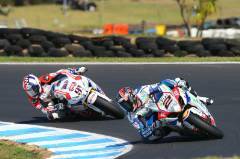 One week earlier Cluzel underwent surgery to repair a damaged elbow from a big testing crash at the Island but put all that behind him to record a firm eleventh place in race on and an excellent seventh in race two. Team Manager Paul Denning added “We will leave Australia after these two weeks in Phillip Island with a positive outlook because, irrespective of two quite disappointing results for Leon caused by the wrong tyre choice in race one and being knocked off the track in race two, we’ve still shown great potential and it’s clear that the bike is at a different level than it was 12-months ago. The whole team and both the riders have been superbly positive, despite a few issues – including five absolutely massive crashes in total! The guys have worked incredibly hard to be in good shape come race-day.